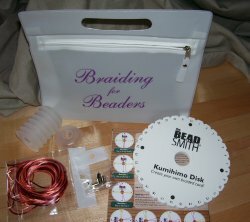 This kit includes the round braiding disk, 8 small bobbins, 8 silver plated end caps (four 6mm and 4 3mm), 12 yards of #1 rattail, and instructions in English in a cool carrying case to keep it all organized. This is the kit that I sell at shows. It has everything you need to get started and it's an excellent value. Please choose the colors you'd like from the rattail photos and list them in the "comment" section of your order. Choose from one to four colors. Jewel Tones, Pastels, Earthtones, Primary, Neutrals: cool, Neutrals: warm, Neutrals: mixed.